Remove meat from soup and reserve soup. Shred the meat into strips. Set aside. To make ravioli: srpinkle meat with half of the allspice and mix well. Place a teaspoon of the beef mixture on a wonton wrapper. Moisten the edges of the wrapper with cold water. Cover with another piece of wonton wrapper. Press wrappers together to seal the edges. Repeat with remaining meat mixture and wonton wrappers. In a pot, heat oil and brown onions over low heat (these brown easily). Stir in leeks and cook until soft. Pour in nilaga soup, rosemary, bay leaf and ramining allspice. Simmer for 10 – 15 minutes. Season to taste with salt and pepper. Slowly drop the wrapped beef into the soup. 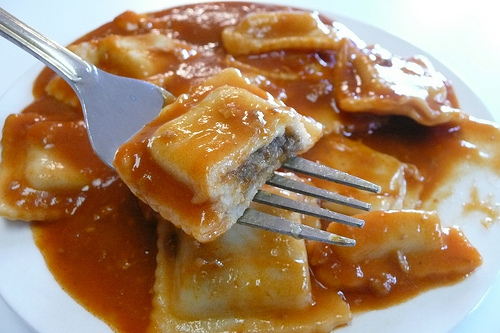 Simmer for 2 – 5 minutes or until the ravioli are soft, stirring occasionally. Garnish with scallions, and serve hot. End.